lesliekeating: here goes... aka oh, eight. here goes... aka oh, eight. okay, here's a big catch up post, nevermind that i know i'm going to miss half of the things i wanted to share or that the photos i finally managed to take are somewhat terrible or that, really, each of these things deserves it's own lengthy post - let's just get caught up, shall we? and move on from here. amen. 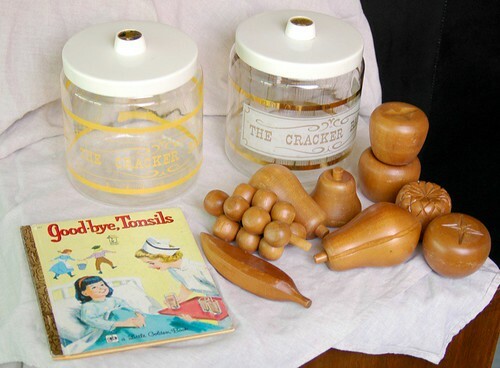 TWO pyrex cracker barrels from different shops, the yellow one was $4 and the gold $1, wooden play fruit for mae for $4 and i had to pick up this golden book for 50¢ - "goodbye, tonsils"... too funny! 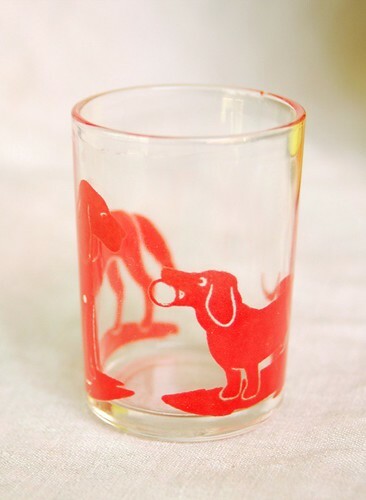 sweet little shotglass with a dachshund playing for 50¢, perfect for mae's future play kitchen. to sum up: mornington peninsula = pure goodness. i've been planning our next visit and scheming up ways that we could permanently move down there ever since we got home. love, love, love. 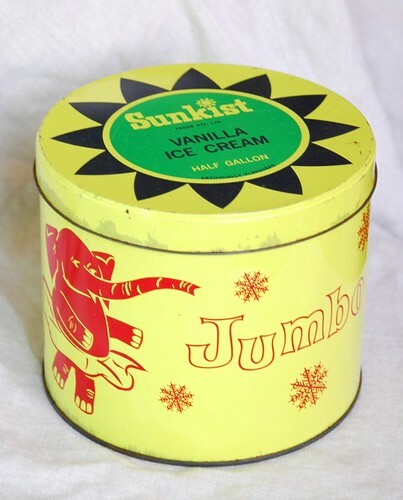 christmas: we were totally spoiled with goodies from canada, too many great things to remember or mention for fear of forgetting other equally great gifts (although i have to say the charlie harper books from old navy are VERY cool). 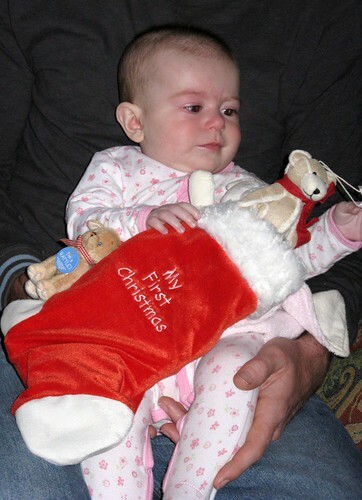 maesey got plenty of clothes and toys, which she looked at through red rimmed, watery eyes and a blocked nose - santa also brought her first cold for christmas which was not very fun for anyone involved (still shaking fist at santa). i made her a new oobee blankee to help with bedtime setting once we ditch the swaddle (soon... soon. she's not using it for naps anymore so we're one step closer) and was super lucky enough to organise a swap with melissa* of tiny happy for these amazing handmade dolls to give her. aren't they fabulous?? melissa sent along a pair of her gorgeous booties for mae as well and they are reversible so you get not one pair but two, really. i love everything and as much as mae would love to get her drooly little mouth on these dollies, they are for display purposed only - until she is a little older. crafting: i made cushion covers for my sister and sister-in-law out of the gorgeous fabric lara sent me but, of course, didn't think to photograph them until it was too late (heath, maybe you can take pic of them in situ and send it to me?) 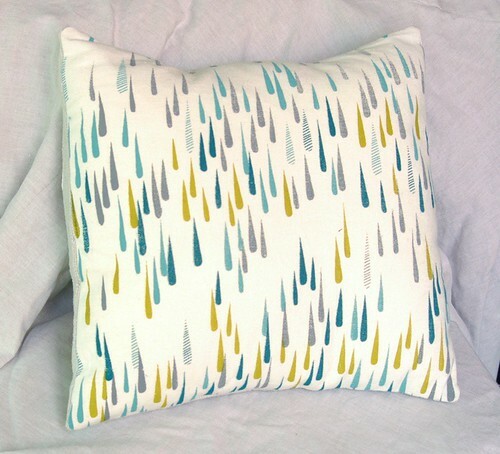 but i also made a set of cushions for our couch with the lovely drops print. the lighting is terrible in the photo but you get the gist. they are smallish and lovely plus gave me the perfect excuse to cut into this amazing, thick, handwoven vintage linen that a friend from edmonton sent me. i just made a simple envelope closure using the selvedge, isn't it wonderful? next up: oh, nine, goals and resolutions for this year. *have i mentioned that melissa and i somehow look a crazy amount alike? every time i see a profile or partial shot of her i automatically think, "oh, someone took a picture of me..." it's really bizarre. It's all really lovely, Leslie! Love that vintage linen. Did you get the egg cup for Mae? yay! you used the linen! I am so jealous that you found Goodbye Tonsils, I had a copy when I was little and loved it. As a child I always wanted to have my tonsils out because the little girl in the book got to eat something nice (was it icecream? or jelly?) after the operation, but it was (luckily) not to be. 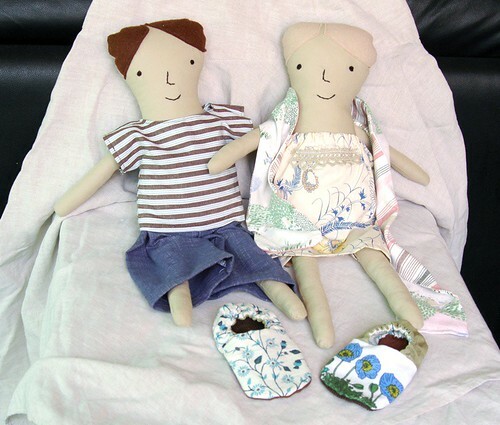 Seems like you're off to a good start this year - love the linen on those cushions! I wanted to tell you that I FINALLY have your Ginger doll ready to post - but I've lost your address! Can you email it to me please - I feel terrible that I've kept you waiting for so long! Looking forward to seeing what you get up to this year - I think it's shaping up to be a good one! 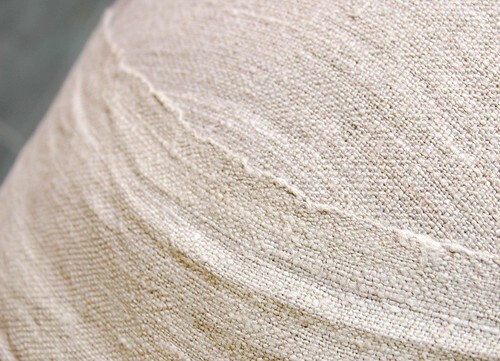 Oooh that linen is gorgeous! I know what you mean about the Mornington Pen., it is one of my favourite places. We spent a few days visiting friends in Red Hill on our recent holidays...it was lovely as usual however I don't usually visit that time of year as the place is FULL. I rarely saw the Red Hill supermarket car park empty! Glad you had a lovely Christmas & the sewing looks great as usual. I definitely have to send you photos of my cushion covers! They are soooo beautiful! Thank you again, Les. Oh, and the little vintage casserole dish looks fab in my kitchen. I'll send you a photo of that too. arrghh- how did i miss this post earlier? sorry! thank you for your kind mention. 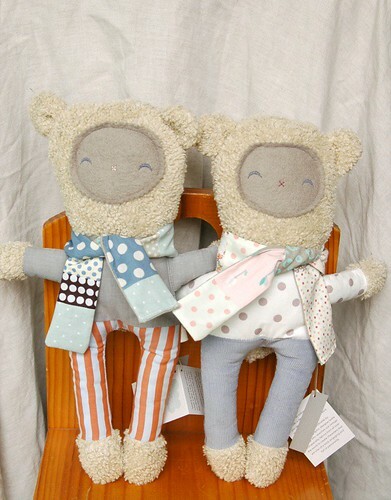 my kids adore their oobees- they sleep with them every night. and isn't that strange about us looking alike? i think about that often when i see pictures of you.